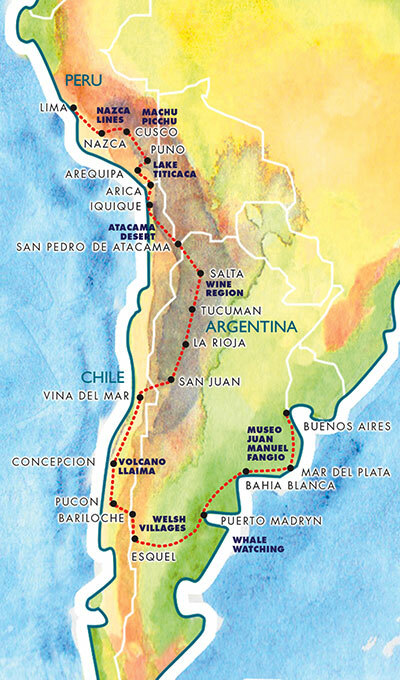 Today we head inland for our second border crossing back into Argentina at Los Libertadores. This border post, at over 3000 metres high, is set against a stunning mountain backdrop. It is one of the main border crossing points, so transit is generally quick and easy. From the border we travel to the city of Mendoza, passing Aconcagua - the highest peak in the Andes before turning north towards San Juan. The circuit just outside San Juan is planned as our final test of the day before we head into the city and our overnight hotel. A beautiful and stunning driving day, climbing ever higher into the Andes as we explore the many gravel roads on offer before arriving at our overnight stop in Puno on the shores of Lake Titicaca - the largest lake in South America. Out hotel is set right on the water’s edge, surrounded by stunning scenery with Peru on one side and Bolivia on the other.